Can you hear it? The "crunch, crunch, creek" of snow under your child's feet as they search under the snow for the perfect rocks. They carefully place the smooth stones on the newly made snowman and turn to you and ask for a carrot nose. Perhaps when you think of snow, you think "brrr, cold. Where's my snow shovel?" 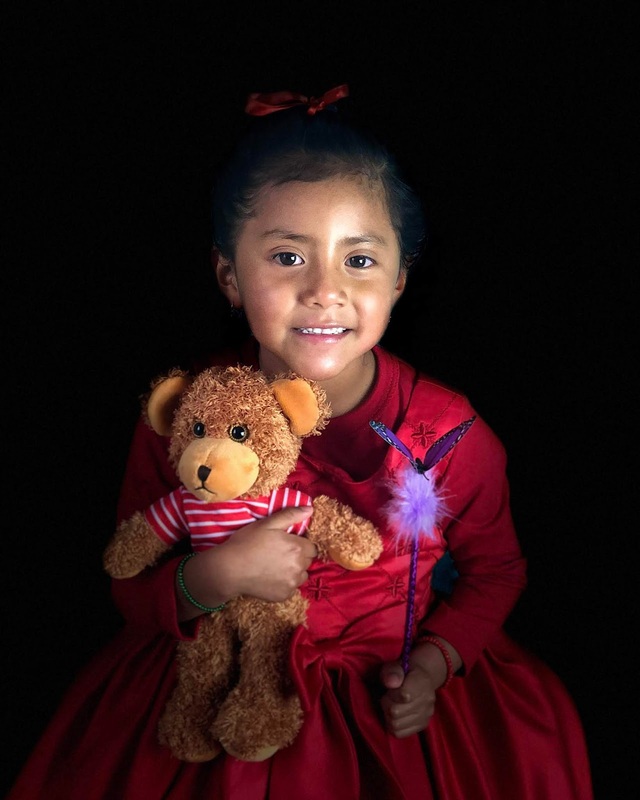 But for many children, the first snowfall brings shivers of excitement, not memories of chilly weather. Kids love to have fun and love it, even more, when mom or dad take the time to play with them - even if that means braving the ice cold. In the same way that a little fun makes snow more enjoyable, things like chores, studying and other activities can also become more enjoyable and exciting when kids feel involved and are having fun. However, sometimes finding supplies that are kid-size is a little difficult. At Ministry Ideaz we recognize the challenge of finding suitable supplies for kids and offer a variety of kid-friendly items. A full-size briefcase is probably not going to work for a toddler. Instead look for smaller bags that will be easy to carry for little ones. Consider either the "Charlie" Bag - a simple design just the right size for children - or this adorable toddler briefcase (shown on to right). This toddler's case is designed to be a child-size version of a standard soft-sided briefcase. Not only can your child have something just-their-size (at only 1 lb), but can also be just like daddy with a bag that matches his. 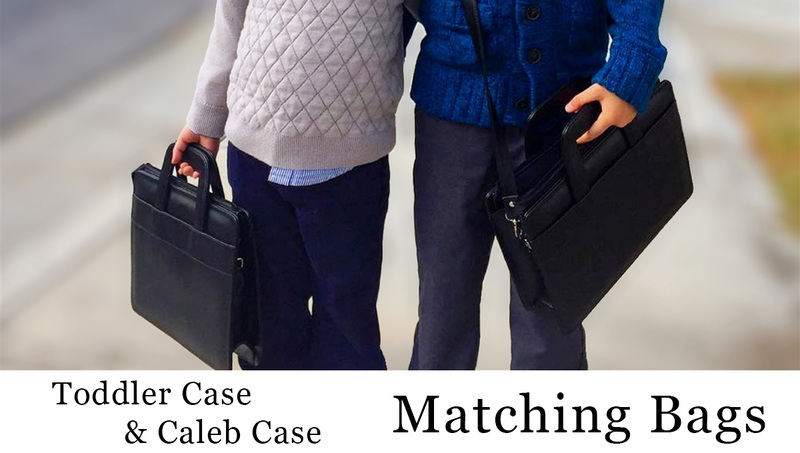 If your child is older, check out the larger version, the "Caleb Case", designed for children aged 5-13.
ac. Also available is the imaginative 'Lil Anna Bag. This bag brings to mind an almost cartoon style - also available in a variety of colors. For the older girls and moms alike, the Sophia bag may be just right. This ministry bag is a bit big for toddlers, but it perfect for the "big kids" who can carry a little more. With enough room for all your meeting supplies, this bag is great for all ages and moms like it too. Get your favorite color for your own unique style. Now that your child has their own bag, they get to pack it with their meeting supplies. What is your child's favorite publication? Do they have a notebook and a pen? If they are prepared, they are more likely to feel involved and able to participate. If you are looking for add-on items for your order, consider specialty items for the kids - meeting notebooks, or fun pens and pencils. Even these items are designed to appeal to their imaginative young minds. You probably already saw Ministry Ideaz assembly notebooks designed especially for kids. But, have you seen our pencils yet? These fun pencils are designed to encourage children to learn, create and enjoy themselves while notetaking. Each pencil has the theme of one of the 2019 Assemblies: "Be Bold" and "Be Strong"! Pencils are great for all ages! Your child can write/draw to their heart's content. You will have no need to worry that they will accidentally write where they shouldn't. Since, unlike a pen (which has ink), pencil marks can be easily erased. Kids have active imaginations, and they love both bright colors and adorable animals. 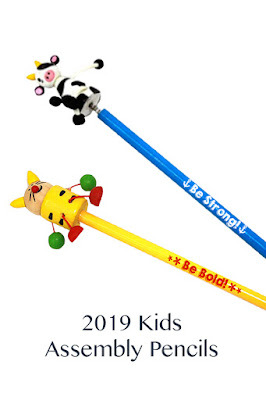 Encourage creativity with these fun pencils - featuring a cat or a cow. With these pencils and a notebook, your kids will be joyfully engaged for the assembly program. Check out all our fun kid's supplies online. Have you seen the new pocket planner? The 2019 Pocket Calendar for Jehovah’s Witnesses is structured to provide 16 total months, making it the perfect addition for the 2018-2019 service year. This beautifully designed pocket planner addresses all aspects of planning your routine, including space to record important dates and a cleanly organized pioneer schedule. It also features a handy spot to record your monthly service report - efficiently organized for any publisher. The cover is rendered with an eye catching artist's depiction of paradise. 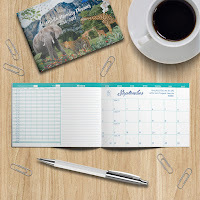 This 2019 Theocratic Monthly Planner for Jehovah's Witnesses can be purchased in either a small or medium-size version, allowing individuals to optimize their organization. Furthermore, you can add an extra layer of protection by purchasing a 2019 pocket calendar outfitted with a special vinyl cover. Those interested in purchasing multiple planners can benefit from special prices on 20, 50, or 100 units. As a bonus, orders of 100 or more are eligible for free shipping within the United States. It's not too late to get one. For years Ministry Ideaz' Theocratic Pocket Planner has been a staple item for many happy customers. Since its introduction, we have expanded our selection to include many handy options - from weekly agendas, to notebooks - to help the friends in their daily routine. Created with quality paper, the 38-page notebook contains Circuit Assembly talk themes and plenty of space for taking notes. The notebook is designed to be used at both Circuit Assemblies and comes with programs for each one. One side of the notebook bears the “Be Strong!” Circuit Assembly, and users can flip it over to access materials for the “Be Bold!” Circuit Assembly. In addition, the book features a “review questions for meditation” section with space for note taking, which can require one or two pages, depending on the length of a Circuit Assembly talk. Did you ever use a memory technique to remind you of an important task? Perhaps you tied a string around your finger, or wrote yourself a sticky note and posted it where it in a visible place. Now you can even talk to your cell phone and if with set a reminder for you. With a busy schedule, it can be hard to keep track of everything. While we all try our best to stay organized there are many methods and tools that can help! Ministry Ideaz has many useful tools to help you in the new service year - from organizers and planners to notebooks and pens - and lots of ideaz 😉 to help along the way! If you like to see things laid out in front of you on pen and paper, but want a planner that's compact, a pocket-sized planner might be the way to go. A planner like the 2018-2019 Monthly Planner is available in two slim, small sizes. It's ideal to make a note of your service time and placements for the month and keep track of when you made return visits. With bonus pages in the back, make particular note of important dates or special plans during a C.O.s visit. Add a reusable vinyl cover and keep it in tip-top shape for the whole 16-months. An all-in-one. Keep track of it all with 6 sections of refillable pages - Monthly pages, RV notes, magazine route, Bible study notes, and more! The benefit of a 3-ringed binder is that it's customizable. Use all the sections or just a few. Add your own accessories! Perhaps a few handy sticky notes or sticky bookmarks. Slip your loose pages or contact cards into the inside pockets. Use your favorite pen with the convenient elastic holder. Binders have loads of possibilities! And, if you decide to switch things up (move notes around) all you need do, is open the rings. 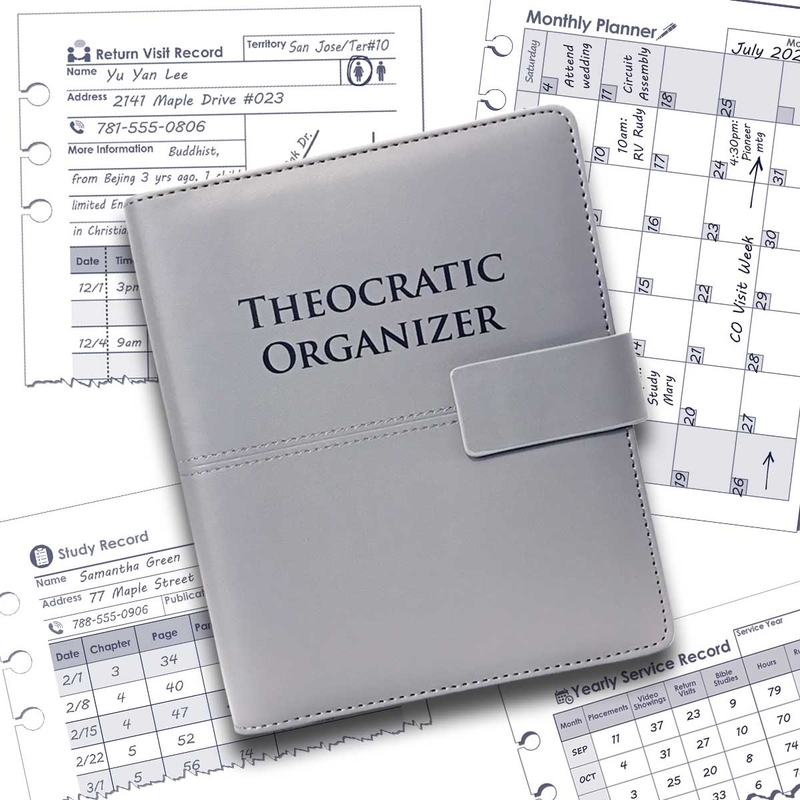 Ministry Ideaz's Theocratic Organizer is designed to help, well, keep you organized. For RVs, it helps remind you to make a note of the easy-to-forget-details - so that you're prepared for the next visit. For the tech-savvy, perhaps you prefer your phone. There are hundreds of calendar apps out there, but whichever platform or app you use, it's important to remember to check your calendar. If you have an important appointment, don't forget to set an alert. That way you won't miss it! If you are particularly forgetful - or just really busy - a digital calendar can be very rewarding. Use a reminders app to keep things in order. You can set a reminder for pretty much anything you might forget. Did we forget one of your favorites? Let us know in the comments below! Perhaps you prefer a wall-calendar, a weekly planner, or a combination of ideas. Whatever your preferred planner, you can add flair and fun, with useful accessories. Sticky notes can do wonders! They are handy additions to anyone's bag and are very versatile. You can leave them as notes for others or make a note for yourself. At Ministry Ideaz we make some specialized sticky notes for return visits, bible studies, or to keep track of your field service. Use colorful sticky notes along with highlighters to color code your organizer. Pick a different color for a different kind of note or appointment. Make it easier to tell with a glance what's in your schedule. What are your favorite organization accessories? Let us know in the comments! 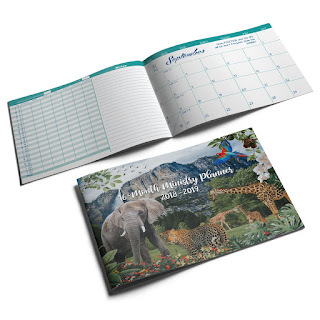 The 16-month pocket-sized calendar for Jehovah’s Witnesses features an artist’s rendition of paradise on the cover and runs from September 2018 to December 2019, making it a useful tool for the service year. It also provides consumers with an ideal solution for recording important dates, planning pioneer schedules, and tracking service reports. Additionally, the calendar has areas for planning service events and contains two special sections for keeping track of Awake! and Watchtower magazine routes. Bible texts and inspirational quotes also appear on each month. The calendar is available in two sizes: a small one that fits neatly into a shirt pocket and a 30-percent larger one for individuals who experience difficulty in reading smaller fonts. Each calendar is 44 pages printed on high-quality paper with a full-color cover. Based in Ecuador, Ministry Ideaz offers a variety of handcrafted ministry supplies created using quality tools and materials. Ministry Ideaz delivers products directly to customers through an online storefront. 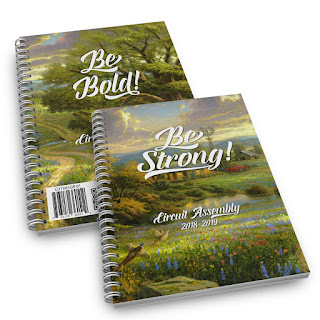 Its inventory includes the 2019 Theocratic Monthly Planner for Jehovah’s Witnesses. The Intrepid ministry case is one of the organization’s most popular items. 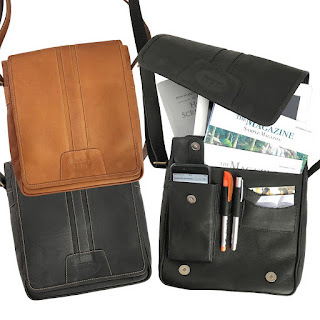 Made of high quality leather, the case has been specially designed with ministry service in mind, featuring large pockets sized for tablets, the Bible, and other important literature, a number of smaller compartments for service sheets and educational materials, multiple holders for pens and contact cards, and a cell phone pocket. The versatile front pocket is especially beneficial to ministry members, as individuals can arrange all of the items they need for their next service stop in one easy to reach place. The Intrepid ministry case comes in midnight black, chocolate brown, and tan. Despite the durable and comprehensive design, the case weighs just 1.32 pounds, making it ideal for any field service outing. Ministry Ideaz was established in 2003 to develop and provide various handcrafted ministry items for Jehovah’s Witnesses around the world. Now with an expanded line of trusted products, Ministry Ideaz is capable of addressing a wide range of service needs.